Your host, K4SWL, asked me to share my experiences in trying to find a small, lightweight, battery pack for use with my field-portable QRP station. While I’m looking for a battery pack specifically for my Elecraft KX1, what I’m learning should be useful for users of any low-current QRP transceiver. Currently, I’m experimenting with a pair of ten-cell AA battery-holders, one of unknown provenance (photo) and a new, more rugged one from Batteries America (p/n 10AAT, photo). 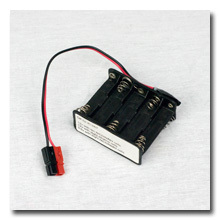 When filled with ten AA NiMH cells, the resulting battery-packs provide about 14v at full-charge. At the 2012 Flight of the Bumblebees, my KX1 generated an indicated 2.6w on 20m and 4w on 40m while being powered by one of these packs; the nearly four hours of low-stress operating during this event did not discharge this pack of 2,000mAh cells very deeply. 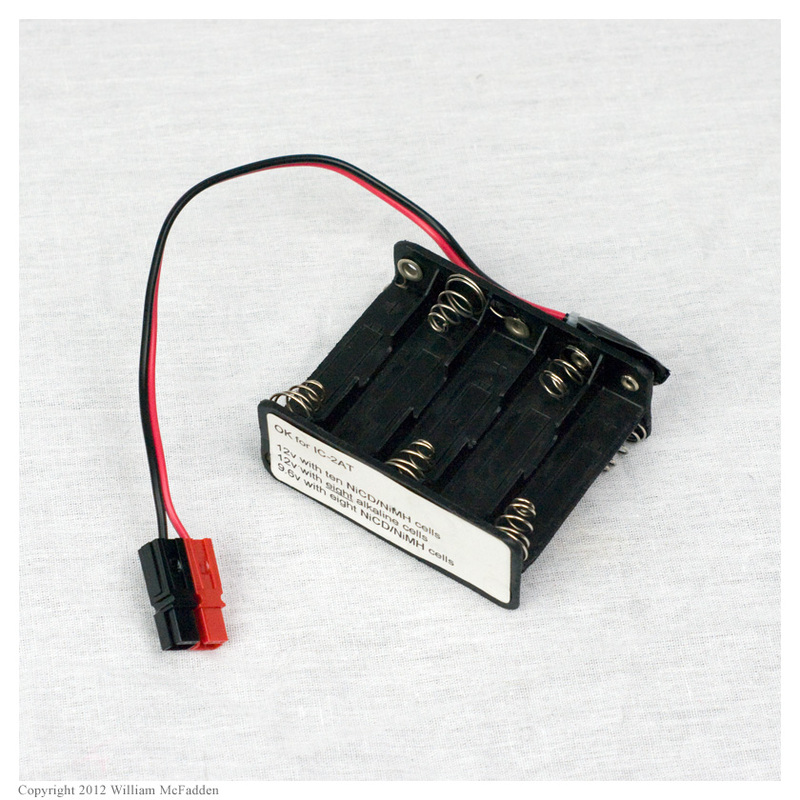 The use of two AA dummy-cells will also allow the use of eight lithium primary or alkaline cells in an emergency. 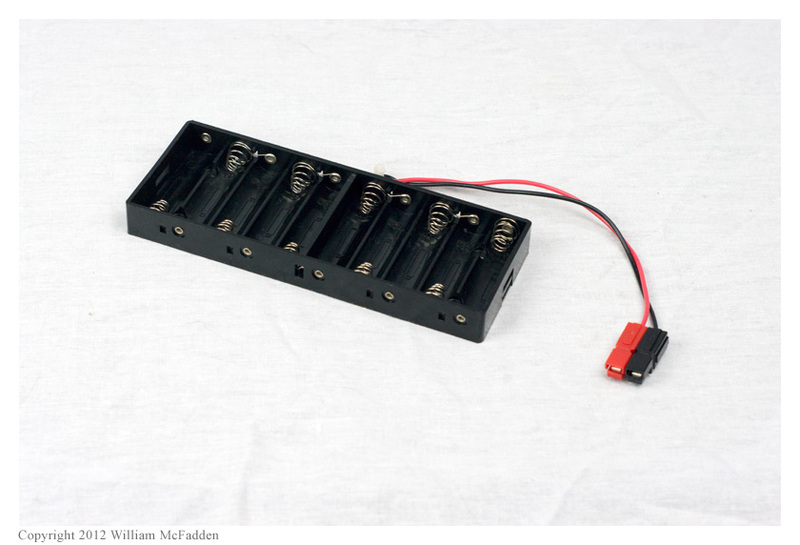 I became concerned about using this style of spring-contact battery-holder when I found an article (link) by Phil Salas, AD5X, in which he reported that this sort of battery-holder is likely to display significant voltage drop under load. I tested my original battery-holder with ten 2,000mAh NiMH cells and my KX1 transmitting into a dummy load. In addition to measuring whole-pack voltage-drop, I measured the voltage-drop of each of the individual 2,000mAh cells as I transmitted into the dummy load on 20m. The sum of these individual drops was 0.52v, so I’m losing 0.24v in the spring-contacts and/or battery-holder’s “transistor battery” output connector. I’m losing about 0.20v in the battery-holder’s spring-terminals, slightly less than with the older battery-holder. The 0.20v ~ 0.24v drop from the spring-terminals doesn’t seem excessive to me and the difference in these measurements between the two battery-holders is probably not significant. I am more concerned by the 0.53v ~ 0.54v voltage-drop I measured in the individual cells. It is likely that these older 2,000mAh cells, which have been cycled many times, are exhibiting greater voltage-drop than new cells would. To test this theory, I purchased new 2,100mAh cells to measure. I measured the new cells as above, again on 20m into a dummy load, and found that with each of the battery-holders, the sum of the individual cell voltage-drops was 0.22v, so my speculation appears to have been correct–the new cells do have lower voltage drop under load than the old cells do. The new 2,100mAh NiMH cells are marketed by Polaroid and cost $6 per four-pack at Big Lots; the least expensive AA NiMH cells available at Batteries America, 2,500mAh Sanyo cells, cost $3 each at the time of this experiment. I don’t know if the Polaroid cells will last for as many cycles as the probably-higher-quality Sanyo cells would but trying the significantly less expensive Polaroid cells seemed like a a good gamble. 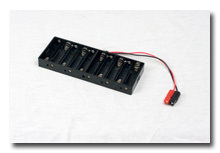 As indicated above, the new battery-holder (Battery American p/n 10AAT) is more rugged than my original battery-holder; it holds the AA cells more securely and and doesn’t use a “transistor battery” connector to connect to the load. I replaced the original nylon connector with a pair of Anderson Powerpoles. This battery-holder will be my preferred battery-holder for field operations with the KX1. In his article (link), Phil Salas, AD5X, recommends foregoing battery-holders in favor of soldered/welded battery packs but I will continue to experiment with battery-holders. I prefer to charge my NiMH cells individually, using an intelligent MAHA charger, rather than charging an entire pack. In addition, my KX1 draws significantly less current on transmit than Phil’s IC-703 does so the the IxR losses I’ll experience will be less significant than that which Phil experienced. Visit my website to learn more about my QRP operations or to learn more about my KX1 Mini Travel Kit. * What had I done wrong? I discovered when testing my new battery-holder that the previous measurements of the old and new NiMH cells in the original battery-holder had been made with the KX1 transmitting into a 50Ω dummy load with the KX1 autotuner configured in tune mode instead of in bypass mode; because the KXAT1 autotuner doesn’t sense a mismatch and automatically tune, this meant that transmitter current–and the measured IxR voltage losses–might be also be significantly different than with the KX1 transmitting into a matched load. Comparisons of my original numbers to measurements made later of the new battery-holder wouldn’t be meaningful, so I had to do all the measurements again. This entry was posted in Grab And Go, Portable, QRP and tagged Elecraft KX1, Elecraft KX1 Battery Pack, Ham Radio, HomeBrew Battery Elecraft KX1, QRP, WD8RIF. Bookmark the permalink.